GoPro today announced a new feature for its iOS and Android applications called "QuikStories," launching within a rebranded app that's now simply called "GoPro" [Direct Link], which works in conjunction with another app called "Quik" [Direct Link]. The company described QuikStories as way for users to easily share cool experiences to social media that they captured on a HERO5 camera. 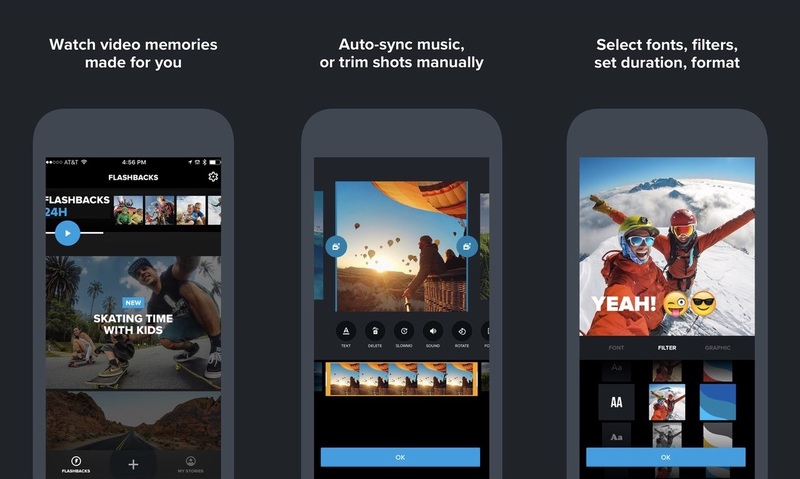 Similar to Apple's Memories feature in the iOS Photos app, QuikStories accumulates recent footage captured by the user and generates easily-shareable videos on the user's smartphone. This removes the need for users to go through a cumbersome editing process for shorter-length footage that they just want to share to social networks like Instagram and Snapchat. To make a QuikStory, users have to pair a HERO5 Black or HERO5 Session GoPro device with their smartphone, open the main GoPro app, and pull down on the home screen, which begins the process of copying the latest footage to create the QuikStory. The main app communicates with the Quik app so users don't have to jump between the two. "QuikStories is our biggest leap forward since the invention of the GoPro itself," says GoPro founder and CEO, Nicholas Woodman. "QuikStories is the simple storytelling solution our customers have been dreaming about for years. It's an absolute game changer." If deeper customization is desired, users can also add their own text, slow motion and speed effects, alternate filters and soundtracks, edit the video's length, and more. On the Quik app's description within the App Store, the company said that transitions are automatically synced to the beat of the chosen song, with users able to import their own music from iCloud Drive, Dropbox, Google Drive, and more. Users can leave the app while GoPro creates their QuikStory, and then a push notification will alert them when it's ready. From there, it can be shared on Instagram, WhatsApp, Snapchat, Facebook, and via text and email directly from the GoPro app. The main GoPro app, formerly known as Capture, is available to download from the iOS App Store for free [Direct Link]. I don't have one of these GoPro's but the story was well written.